Confession: This stole isn’t exactly new. My very tall and very dear G. gave this to me on the occasion of our first anniversary. G. commissioned it from a member of the church he was interning at last fall, the beautiful (and incredibly money-where-your-mouth-is St. Mark UMC in Atlanta). One of my favorite things about this stole is the fact that it’s double-sided. The last church I served used blue as it’s primary Advent color. 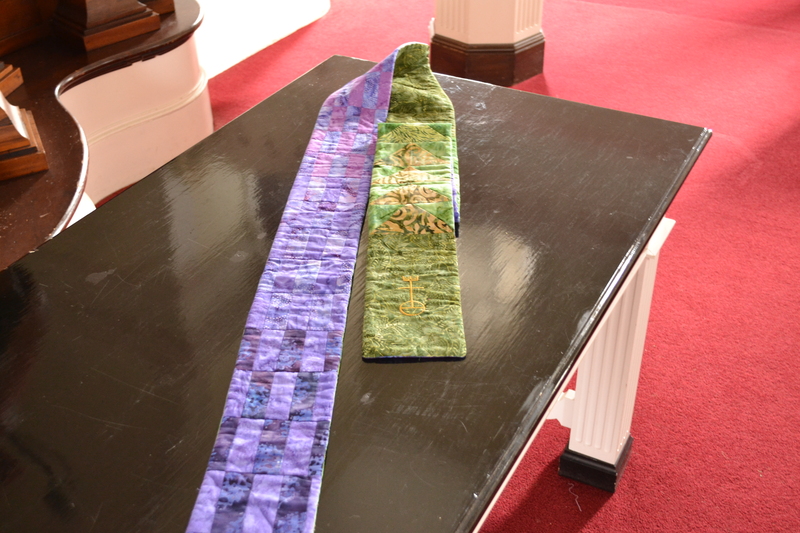 So, while I had some purple stoles to use at Westfield during my first Advent up here, they are mostly Lenten themed. 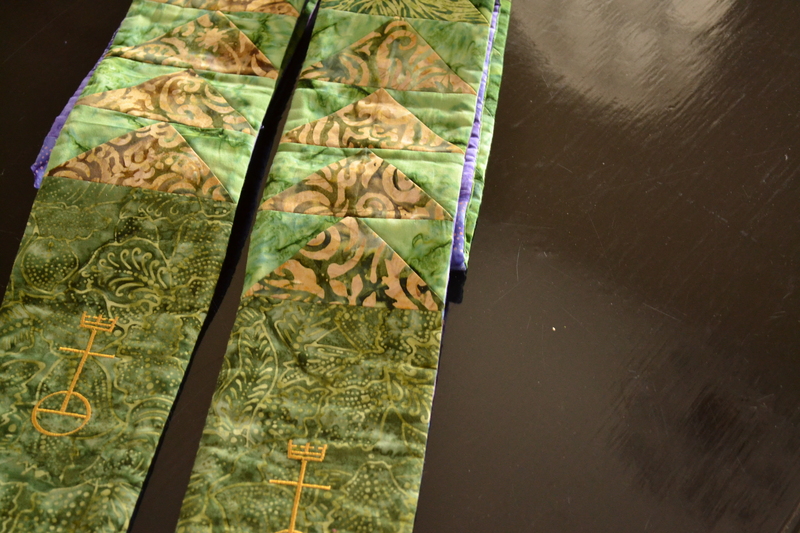 G., after taking a very thorough inventory of my stole collection, decided to rectify the situation. Flying geese became a signal to follow the direction of the flying geese as they migrated north in the spring. They became a guide to find water, food, and a safe place to rest. Migrating geese display freedom that points being in relationship with their Creator, totally giving themselves to the Creator as the go where intended. Their sense of freedom, of shared leadership and of responsibility for the entire flock is a symbol and example that still speaks to all humanity. Beautiful, isn’t it? It’s even more beautiful when you realize that I migrated North myself a few short days after G. gave me the stole. 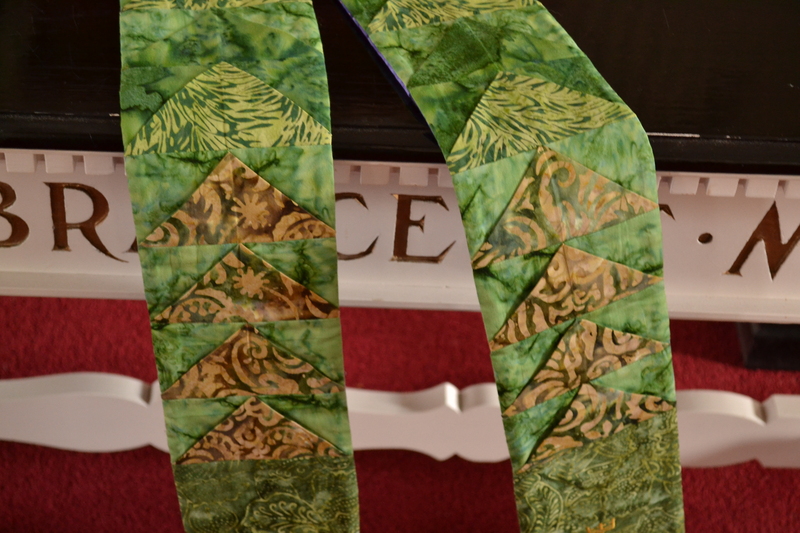 Each side is quilted and features the UCC symbol. I love the two sided idea. Betsy and I were talking about doing something like that on stoles with designs that may not be used as often. 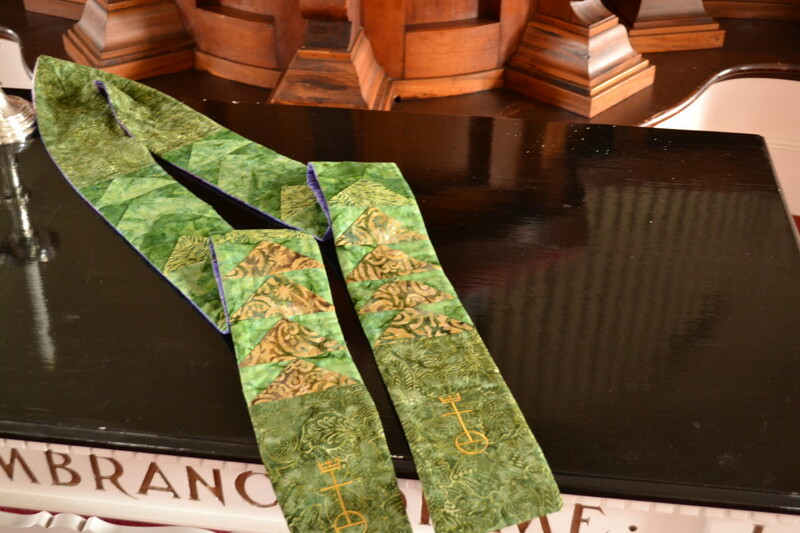 It also adds some weight to the stole which helps it to lay properly. Interesting information regarding the flying geese pattern. Back in the day when my mother and her friends did quilting on one of those large quilting frames that were lower & raised from ceiling, my job was to cut those flying geese pieces, among other patterns. 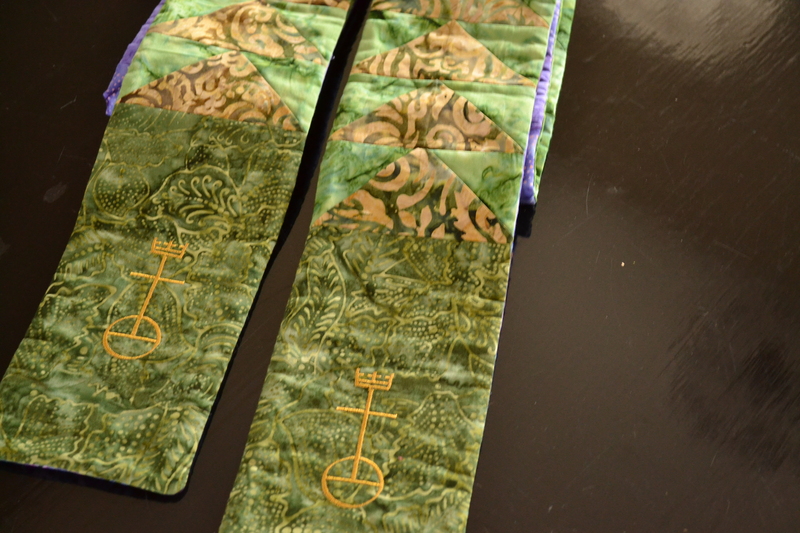 It’s a beautiful stole and I have gained more appreciation for the flying geese. Memories…. 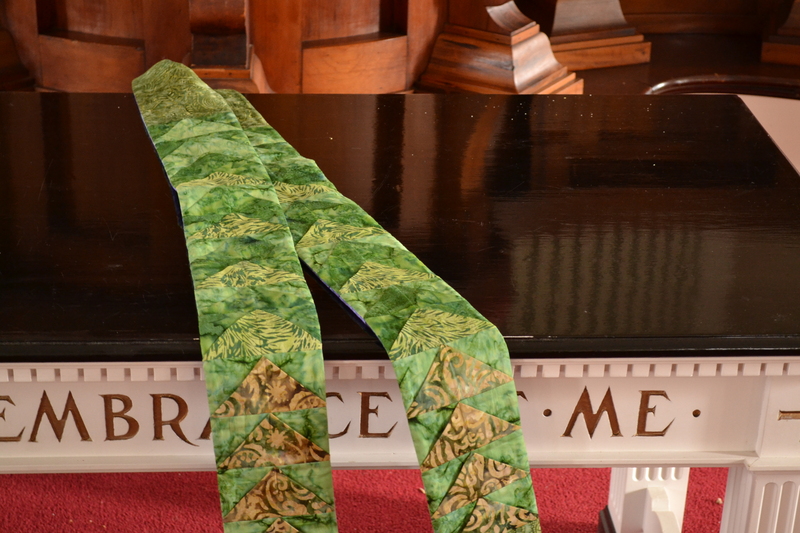 Jonathan, I am so glad that you like the stole. I enjoyed making it for you. I also enjoyed the others that “G” and parents asked me to make for you. May God bless you and bring joy to you everyday! Keep an eye out for the others, Scott! They’ll be making an appearance soon, I’m sure!